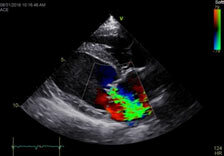 An echocardiogram (ultrasound of the heart) uses ultrasound waves to create real time images that allow the cardiologist to evaluate the heart size, valve function and heart strength. Most people are familiar with ultrasound technology that is used for a pregnancy sonogram. A veterinary cardiologist will use the same type of hand-held probe/scanner to image your pet’s heart. It is considered the most sensitive test for diagnosing heart disease in dogs and cats. Will my pet need sedation or anesthesia for the echocardiogram? The echocardiogram is a short (usually less than 15 minutes) non-invasive test and the majority of animals do not need sedation. Veterinary technicians will gently restrain your pet on a padded table. The table has a cutout that allows the cardiologist to lightly place the probe in contact with the chest wall. If sedation is needed to help your pet relax, the cardiologist will discuss this with you prior to giving the sedation. The majority of dogs and cats do not need to be shaved for an echocardiogram. A small amount of alcohol is used to separate the hair. Ultrasound gel is then used to improve contact with the skin and give more detailed pictures. Does my pet need to be fasted? Your pet can eat and drink normally prior to the echocardiogram. If any cardiac medications have been prescribed prior to your consult it is ok to give the medications the morning of their appointment. Will I have the results right away? Yes! The cardiologist performing the echocardiogram will interpret the images in real time then discuss the findings with you. This means you will have a diagnosis and treatment plan before you leave the office. 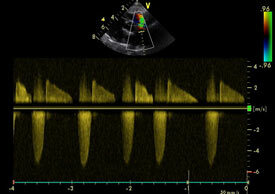 Is an echocardiogram the only test needed to diagnose heart disease? 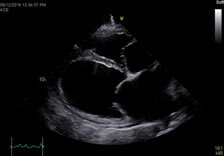 The echocardiogram is the most sensitive test to diagnose heart disease but some patients need additional testing to stage the heart disease and/or determine if medications are necessary. 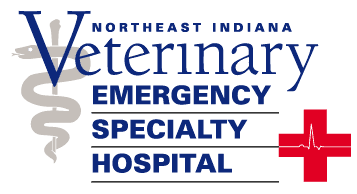 This may include chest x-rays to examine the lungs, an electrocardiogram (ECG) to examine your pet’s heart rhythm, a blood pressure or bloodwork.